If you have wandered through a home décor store, read a design blog or watched many of the shows on HGTV lately, you have probably seen the current trend of using live edge slabs or wood slabs in custom furniture and architecture in homes. Many people like this style because it combines natural and modern aesthetics into one look. This synthesis is the basis of the ongoing trend. Live edge wood slab dining table crafted from an ethically sourced claro walnut live edge wood slab. This table is 10′ long and 48″ wide and is supported by a trussel base. Contact use for similar tables. We also carry the dining chairs. one of a kind rustic dining table. The term “live edge” generally refers to live edge wood furniture, shelving or other architectural detail in which at least part or all of the wood slab outside is a live edge or natural edge. Live edge wood slabs are wood slabs that are milled leaving the outside of the tree intact. Leaving this natural edge or live edge allows for furniture makers to design and craft rustic furniture that is organic, warm and reminiscent of nature. For example, a typical coffee table has four straight sides with four right angles, creating a perfect rectangular shape. The edges are made straight with a saw that trimmed the wavy natural edge off and is finished smoothly. A live edge table, on the other hand, feature at least one edge that is of variable form, perhaps wavy or at an angle, created that way due to the shape of the wood after it was chopped down from a tree. In this style, the furniture retains part of the original organic shape of the tree that was used to create it. Although the bark can be left on the live edge wood slab most people prefer to have it removed. As most will commonly come off the wood. Overall, this style is considered very environmentally friendly. By utilizing the unique shapes and curves of the wood, most of each tree is actually used. This means that each tree goes further toward creating the entire piece, and fewer trees are then used. In addition to the sources of the wood, the process to create the furniture is also good for the planet. Most carpenters or custom wood furniture makers use hand tools to preserve the natural look of the wood. From simple hand sanders and other simple woodworking tools. Finally, the piece is oiled, dried and shellacked to properly seal in the color and beauty of the wood. These actions are generally completed with the minimal use of machines, saving energy and the environment. The beauty of the live edge slab style is that it fits well into many different design styles. Using wood slabs for furniture does not automatically make a room a traditional log cabin. This style of furniture complements any home decor. This style is rustic modern, and it can fit surprisingly well into a number of different design aesthetics. It is the versatility that makes it one of the most popular styles of furniture right now. Buying a finished piece or having a custom piece of live edge furniture built does not have to be a daunting prospect. Because it is as simple as finding a qualified rustic furniture maker. 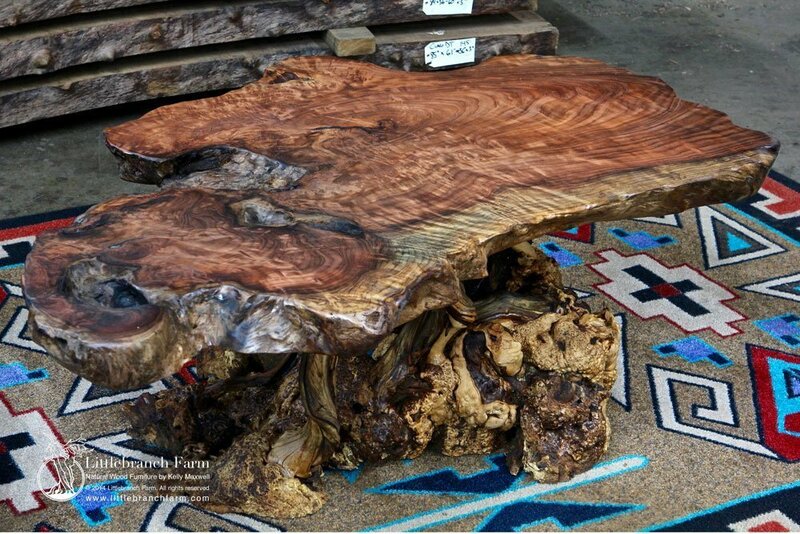 Some styles of furniture crafted using live edge wood slabs are used in rustic vanities, wood countertops, rustic beds, live edge mantels, wood slab desk, accent tables, rustic coffee tables, burl wood furniture and more the only limit is the imagination. If you are especially concerned about including a piece in your home, get more involved in the selection process. 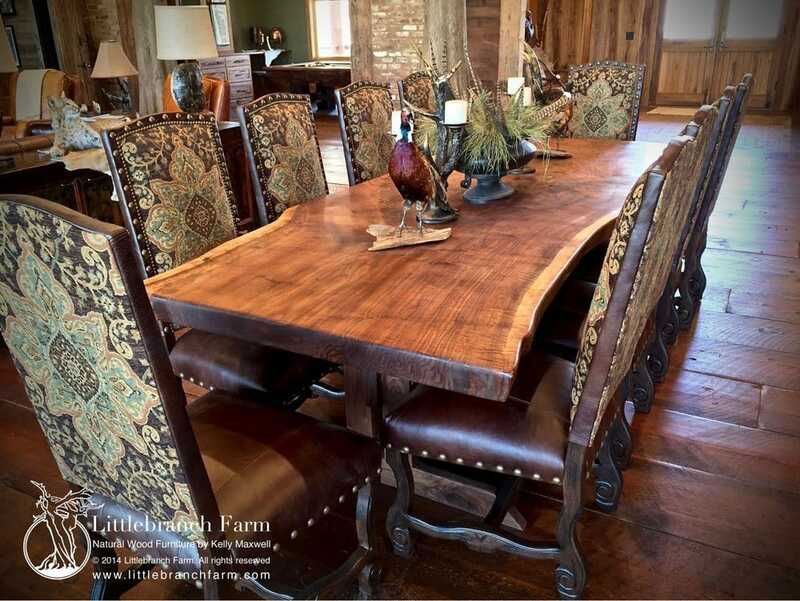 You can find an established local craftsman who will custom build a dining table or other project for you. You can also find craftsman on the internet with great reviews that specialize in live edge slab furniture. Some woodworkers work closely with designing their natural wood furniture. Because each live edge wood slab is completely unique, with knots, checking and other imperfections that make furniture one of a kind. Your craftsman will be able to steer you in the right direction. Live edge wood furniture pieces are custom built by furniture makers. This means that your special piece will be a work of art that completely transforms your space. Consider is this style a trend or a timeless part of your home. Live edge slabs as furniture timeless or a passing trend in the design world. Wood slabs were used in ancient Greek homes as day lounges and beds. Wood slabs and logs were used by furniture makers for centuries. George Nakashima and other artist placed live edge slab wood furniture on the map. In 1946 Nakashima crafted a series of furniture featuring live edge slabs for Knoll. The Mid-Century modern homes. My wife and I needed a live edge piece for a powder room vanity. The Littlebranch Farm team could not have been more helpful. They clearly ae no a ‘Farm Team’…they are total PROFESSIONALS! You will not go wrong using Littlebranch Farm! You made a good point that live edge slab furniture is environmentally friendly. I would think that people feel good about buying that. I think that it’s really important to find the right supplier that can give you what you want.